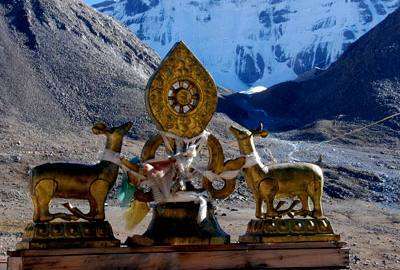 This exciting 5 Days Lhasa Culture Tour offers you insight of Tibet experience come and walk in the mysterious footsteps of this ancient civilization and culture around Lhasa. On this tour you’ll also have a chance to visit the home of a local Tibetan, where you can see how they live and ask them questions over an unending glass of yak butter tea. You’ll also have a chance to step off the map and take a walk around the sandy shores of the emerald Lake Yamdrok. Staring into the lake’s crystal reflection you’ll see a new cathedral in the sky, and then, you’ll understand why Tibet is such a holy place. 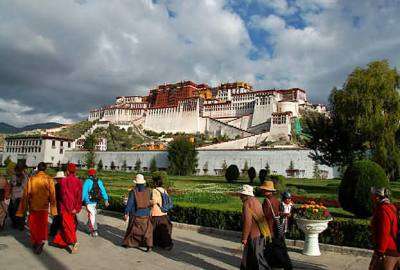 This tour covers the historical sites like The Potala palace, Jokhang Temple and Barkhor street and all the three biggest monasteries in Tibet, Drepung monastery, Sera monastery and Ganden Monastery. 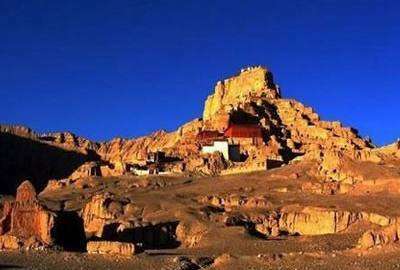 Ganden Monastery is the main seat of Geluk order, situated at an elevation of 3800m above sea level. It is very interesting to trek Lingkor (circle) and you can see the Great Tsongkapa’s meditation cave and the beautiful view of Lhasa valley. Day 01 :Kathmandu to Lhasa (By Flight) Morning you will fly for about an hour over the panoramic Himalayan Ranges to the capital of Tibet. 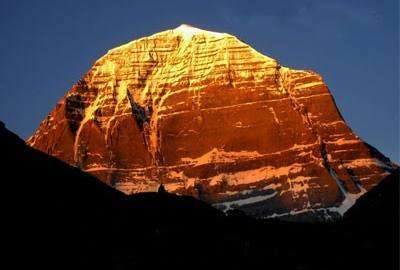 "Lhasa”. 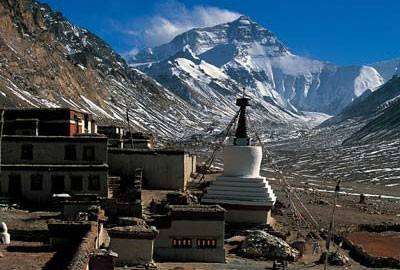 Lhasa at an altitude of 3,650 Mt, is situated on the north bank of Kyichu River. Lhasa in Tibetan means "Place of the Gods", the residence of the Dalai Lama., on arrival you will be met by the local representative and transferred to your respective hotel. (60 km/1hr). Full rest in the afternoon to acclimatize. Overnight at hotel in Lhasa. Day 03 :There are 4 options in day three, we are sure you can find one meets your needs Option 01 : Lhasa sightseeing: Visit Drepung monastery in the morning ; then in the afternoon, have a view of the Sera Monastery. Option 02 : Lhasa- Ganden- Lhasa In the morning, drive to Gandan Monastery. Have a hiking around Gandan and it is called “Gandan Kora”, it is a simply stunning walk and should not be missed. There are superb views of the Kyi-chu Valley along the way and there are usually large numbers of pilgrims and monks offering prayers, rubbing holy rocks and prostrating themselves along the path. Right after that, drive back to Lhasa, and go for a family visit on the way. Option 03 : Lhasa/YamzhogYumco Lake /Lhasa Drive to Yamdrok Lake from Lhasa in the morning. You will enjoy the spectacular scenery. Yamdrok Lake is a coiling, many-armed body of water shaped like a scorpion. It doubles back on itself on the western side, effectively creating a large island within its reaches. 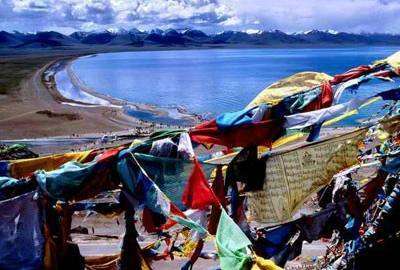 For Tibetans, it is one of the four holy lakes of Tibet. And the home of wrathful deities. The lake lies several hundred meters below the road, and in clear weather is a fabulous shade of deep turquoise. Far in the distance is the huge massif of Mt. Nojin Kangtsang (7191m) Option 04 : Lhasa/Namtso/Lhasa In the morning, drive to Namtso, you can appreciate Namtso Lake at there and take photos,then drive back to Lhasa. Namtso Lake With an area of 1,940 square kilometers, the Namtso Lake is the second largest salt-water lake. In the lake, there are 3 islands, which is an ideal habitat for all kinds of aquatic life. One of the islands is made of calcareous sandstone. It is characterized by the stone pillars, natural stone bridges and the stalactite caves. The beaches of the lake are a beautiful natural pasture. Wild life is having a good time there. Day 04 :There are 3 options in day four, we are sure you can find one meets your needs Option 01 : Lhasa- Ganden- Lhasa In the morning, drive to Gandan Monastery. Have a hiking around Gandan and it is called “Gandan Kora”, it is a simply stunning walk and should not be missed. There are superb views of the Kyi-chu Valley along the way and there are usually large numbers of pilgrims and monks offering prayers, rubbing holy rocks and prostrating themselves along the path. Right after that, drive back to Lhasa, and go for a family visit on the way. Option 02 : Lhasa/YamzhogYumco Lake /Lhasa Drive to Yamdrok Lake from Lhasa in the morning. You will enjoy the spectacular scenery. Yamdrok Lake is a coiling, many-armed body of water shaped like a scorpion. It doubles back on itself on the western side, effectively creating a large island within its reaches. For Tibetans, it is one of the four holy lakes of Tibet. And the home of wrathful deities. The lake lies several hundred meters below the road, and in clear weather is a fabulous shade of deep turquoise. Far in the distance is the huge massif of Mt. Nojin Kangtsang (7191m) Option 03 : Lhasa/Namtso/Lhasa In the morning, drive to Namtso, you can appreciate Namtso Lake at there and take photos,then drive back to Lhasa. Namtso Lake With an area of 1,940 square kilometers, the Namtso Lake is the second largest salt-water lake. In the lake, there are 3 islands, which is an ideal habitat for all kinds of aquatic life. One of the islands is made of calcareous sandstone. It is characterized by the stone pillars, natural stone bridges and the stalactite caves. The beaches of the lake are a beautiful natural pasture. Wild life is having a good time there. Day 05 :Lhasa to Kathmandu (By Flight) Transfer to airport to connect return flight.